HOTELS IN ADANA Adana, another of Turkey's historically fascinating treasure troves, with a wonderful climate, is the centre of Cukurova. This is one of Cilicia's pivotal cities and a center of the country's cotton industry. 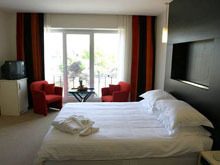 HOTELS IN ANKARA Despite its long history, Ankara is a thoroughly modern, well-planned city. photogenic old town area, is comprised of narrow, winding streets and old wooden houses around the ancient city walls. ( Kusadasi ) Kusadasi is a lovely town, a popular port, and an attractive holiday resort as well. Covered with flowers, this islet is on the beautiful shores of Aegean Sea. HOTELS IN BURSA Since it was the first Ottoman capital Bursa is very rich in religious monuments, mosques and tombs (turbes) as well as warm, mineral-rich springs. HOTELS IN BODRUM At the junction of the Aegean and the Mediterranean, Bodrum is a picturesque town, occupying a small, but beautiful peninsula..
HOTELS IN CAPPADOCIA Its oldest name was ‘Nyssa’ where the first settlements date back to 3000 b.c.e. The castle which stands at the highest point of the city is a good example of the interesting vestiges of the Seljuk period. ( Pamukkale ) The sources of thermal water for Pamukkale are about 20 km from Denizli. The ancient city of Hierapolis is also located in the same place. HOTELS IN FETHIYE Fethiye was called Telmessos in antiquity. Above the town, numerous Lycian rock tombs were cut into the cliff face, reproducing the collonades of archaic buildings. HOTELS IN MARMARIS Fethiye was called Telmessos in antiquity. Above the town, numerous Lycian rock tombs were cut into the cliff face, reproducing the collonades of archaic buildings. HOTELS IN KONYA Accommodating one of the earliest human communities, Catalhoyuk is an ancient city of that period which is considered to be one of the first settlement areas in the world. Made up of mud houses, which were entered through holes in the roofs, this site is a real place of interest where you can feel the life prevailing, many years ago. One of the oldest areas of Hittite origin, Gaziantep is one of the modern provinces. Being the center of pistachio nut cultivation in Turkey and with its extensive olive groves and vineyards, Gaziantep is also one of the important, industrial centers of Turkey. Turkey's Aegean shores are among the loveliest landscapes in the country.